The Tory party rely on gullibility to generate political support. There's no other way of putting it. If you look at the social media infographic they're spreading about manufacturing output being at a 10 year high and accept it at face value, then it looks like a positive economic story. However, if you apply even the remotest critical judgement, and put the claim into any kind of context, then it's actually a profound admission of failure crudely dressed up as an economic success story. If UK manufacturing output is at a ten year high, this means that manufacturing output has been weak for the entire period of Tory austerity dogma between 2010-18. 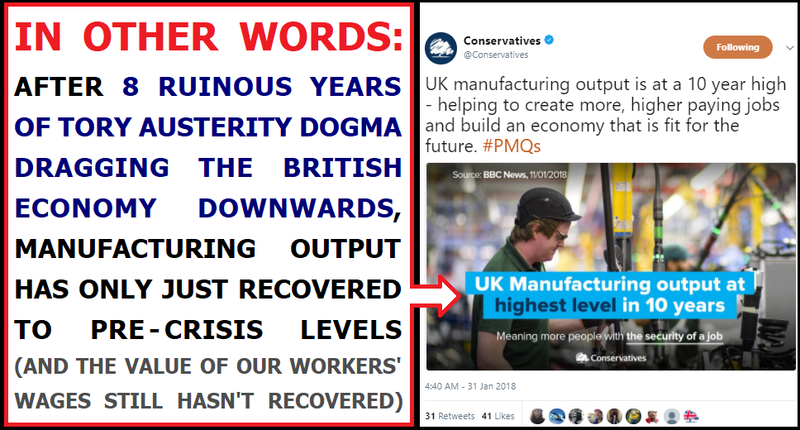 What they're actually saying is that their imposition of ruinous Tory austerity dogma on the UK economy has retarded manufacturing output so badly that it's only just recovered to pre-crisis levels a full decade later. 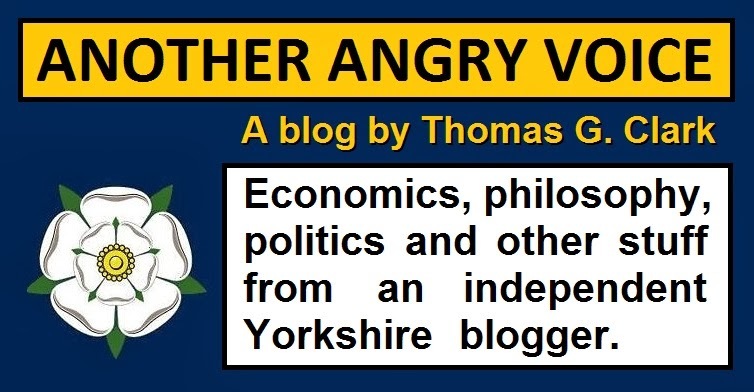 What they've actually done is just reinforced the fact that their fixation with hard-right austerity dogma has resulted in the slowest post-crisis economic recovery since the time of the Napoleonic Wars! What's even more mind-boggling is the fact that they're actually expecting a slap on the back for it! Another important piece of context is that the average real value of UK workers' wages has still not recovered to pre-crisis levels, mainly due to the Tory policies of deliberately repressing public sector wages and allowing an exponential growth in low-paid unstable jobs (zero hours contracts, fake self-employment, the gig economy). If manufacturing output has finally staggered back to pre-crisis levels, yet workers wages are still significantly below pre-crisis levels, what does this tell us about the state of the UK economy after eight years of hard-right Torification? And if the real value of workers' wages is still lower than a decade ago, what does this tell us about the Tories' fine words about creating "more higher paying jobs and an economy that's fit for the future"? Just imagine being so confident that the public are a bunch of easily manipulated dupes that you can dress your disastrous economic failings up as some kind of magnificent success story, and expect them to mindlessly lap it up like manna from heaven. Try to put yourself in the mindset where you could dress the worst personal failings of your life up as some kind of wonderful success story and expect the people around you to believe it, and even slap you on the back for it, and that gives you an small insight into the sheer levels of arrogance, self-delusion, and elitism that abound in the Tory party. 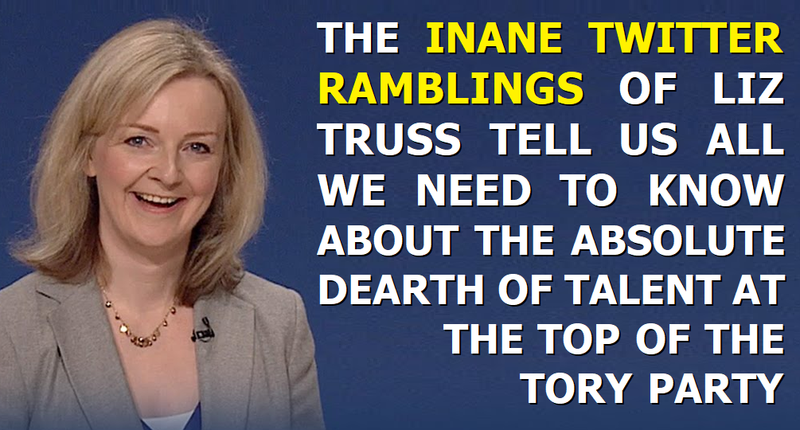 The current Tory government is rammed full of extremely low calibre individuals who have been promoted way beyond their abilities, and the current Chief Secretary to the Treasury Liz Truss is one of the worst examples of the lot. You only need to look at her Twitter feed to see what a callous intellectual lightweight she is, yet somehow she's been clunking around at the top of the Tory party for years. Before she was made second in command at the Treasury Theresa May actually saw fit to appoint her Lord Chancellor and Secretary of State for Justice. 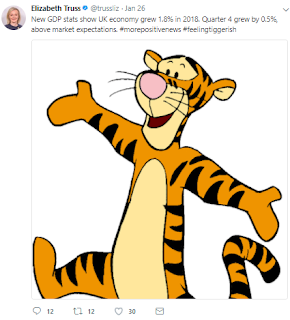 Take Truss's January 26th Tweet celebrating the release of dire economic figures with a picture of the Winnie the Pooh character Tigger and a ludicrous #FeelingTiggerish hashtag. As second in command at the Treasury Truss clearly has no excuse for not understanding that an annual growth rate of 1.8% is the lowest since 2012, and that a quarterly growth rate of just 0.5% makes for the 8th consecutive quarter of below 2% annual growth (the worst run since the bankers trashed the economy in 2007-08). She also has no excuse for not knowing that the UK economy is languishing with the second lowest growth rate in the entire developed world. She has no excuse for not knowing this stuff, so she's either profoundly ignorant of the absolute basics of her own job, or she knows perfectly well how bad it is but she's trying to dress this Tory failure up as a success because she has so much contempt for the "lower orders" that she thinks they'll eat her turd and thank her for it, as long as she sprinkles a bit of glitter on it. Either way it's a disgrace. Then take Truss's crass January 30th Twitter "joke" about the ideologically driven suffering her party inflicted on miners and mining communities across the United Kingdom. As a result of the Tory ideological war on the miners and their merciless "leave it to market forces" approach to poverty and unemployment in the communities they trashed there are still dozens of poverty blighted towns across South Wales, the midlands, Yorkshire, the north east, and Scotland. Yet here's a Tory minister laughing and joking about the miners' strike as if crushing an industry that was once the backbone of the empire, deliberately dividing communities, describing working people as "the enemy within", violently repressing workers' rights and political protests, and putting hundreds of thousands out of work is just a convenient setup for an attempted joke at the expense of a political rival. What's even worse is that Liz Truss sat in the Tory cabinet that decided to not bother having a public enquiry into the police violence against miners at Orgreave, despite not having even bothered to review the police files first. In another Tweet Truss tries to defend hard-right free market fanaticism by opining that that she's "pro freedom" because she has supposedly "never liked being told what to do". This is a quite extraordinary statement from someone who's job it was until quite recently to head the entire UK legal system as Lord Chancellor and Minister for Justice. It's a quite extraordinary statement from a woman who has sat in cabinet and voted in favour of scrapping one freedom after another for ordinary people (such as legislating away the freedom from unlawful state surveillance, introducing unlawful Tory charges designed to prevent fair access to the justice system, and the introduction of unlawful Tory forced labour schemes designed to revoke people's freedom to say to to working for highly profitable corporations with no wages and no workers' rights). Worst of all it's astoundingly hypocritical from a woman who has not rebelled once against her own political party since 2015, no matter how depraved, economically illiterate, or downright incompetent their policies. 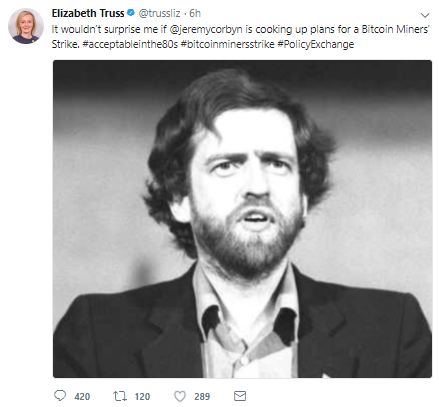 Truss's sub-juvenile and offensive Twitter timeline is an embarrassment that is entirely unbefitting of a government minister, but one tweet stands out above all for sheer idiocy, and it's a lazy rehash of the Mensch fallacy that posits that people are somehow a hypocrite if they in any way criticise the capitalist system if they happen to live in a capitalist system. 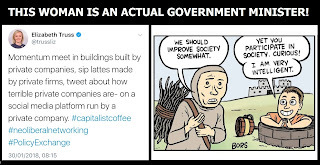 Apparently, according to Truss, it's somehow hypocritical for the centre-left Labour campaign group Momentum to use buildings, drink coffee, or use social media, presumably because they should only be allowed meet in buildings made of twigs, drink river water, and communicate by shouting if they intend to oppose stuff like corporate tax dodging, the Carillion scandal, low wages, and ruinous Tory austerity dogma. The glaringly obvious counterpoint is to make the ridiculous argument that anyone who has ever benefited from social ownership or socialist policies (like using the NHS, driving public roads, having a state education, claiming a pension, tax credits, or child benefits, using any other aspect of the welfare system, or taking advantage of workers' rights like the weekend, paid leave, sick pay, parental pay, protection from unfair dismissal or dangerous working conditions ...) is precluded from ever criticising the excesses of the Soviet Union under Stalin, hyper-inflation in Venezuela, or the repression of human rights in China. 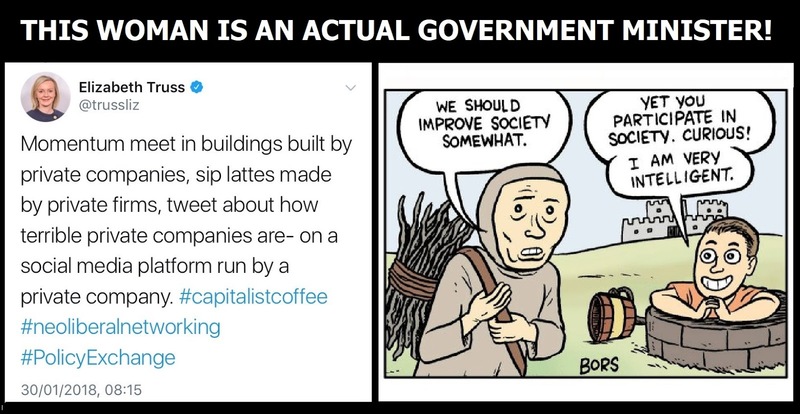 It's like the lord of the manor telling the serf that they can't criticise feudalism because the rags they're wearing are the product of the feudal economy. Just look at the ridicule Truss's former Tory colleague Louise Mensch suffered for using this absurd fallacy, yet here we are years later with an actual government minister making the same idiotic argument. Liz, you're sounding as stupid and desperate as your ex-colleague Louise Mensch with this pathetic drivel. A look at Liz Truss's lamentable Twitter feed, and the knowledge that she's been clunking around at the very top of the Tory government for years tells us all we need to know about the absolute dearth of talent they must be experiencing. How far we've fallen as a nation that such a person could have risen so far in politics. If you were naive enough to judge so-called "mutineer" Tory MPs like Anna Soubry by their words rather than their actions, you would end up thinking that they're leading the fight against a ruinous hard-right Brexit, rather than actually enabling it. Take her "stand up to wreckers" tweet. Those unfamiliar with Soubry's empty posturing might actually think that she's actually arguing against the likes of Boris Johnson, David Davis, Jacob Rees-Mogg and Michael Gove running the Tory party and the nation. The reality is completely different. Soubry knows that Theresa May such a weak leader she simply can't stand up to the hard-right Brextremist fringe of the Tory party. Soubry knows that Theresa May has appointed Brextremists to key positions throughout her government, and she knows that May's future as Prime Minister is hanging by a thread because as soon as the secretive cabal of Brextremist Tory MPs led by Jacob Rees-Mogg turns on her, she's finished. Soubry knows that Theresa May's European Union (Withdrawal) Bill is an effort to use Brexit as a Trojan Horse to enable a hard-right attack on parliamentary sovereignty, workers' rights, consumer protections, devolved parliaments, food standards, democratic accountability, and pretty much everything that has impeded the fanatical fringe of the Tory party from turning the UK into a horrible hard-right dystopia. She knows that the EU Withdrawal Bill is a shameless and shambolic hard-right power grab because she's done an awful lot of grandstanding against it during the legislative process. But then when it came to the crunch she helped to ensure that it passed to the next phase by actually voting in favour of it! 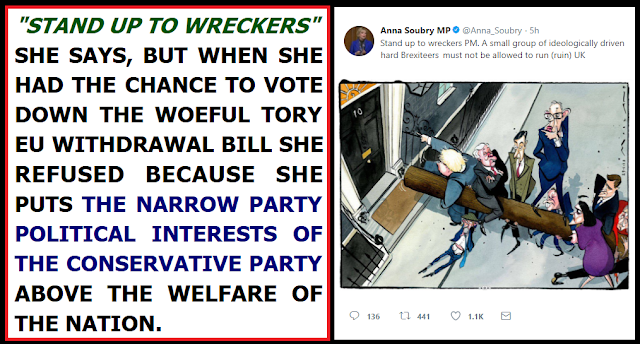 Anna Soubry and the rest of the so-called "mutineer" Tory MPs had the chance to defeat this outrageous piece of legislation by siding with Labour and the other opposition parties to oppose it, but she actually voted in favour of it. The reason she voted in favour of this hard-right power grab is simple: She knew that a defeat on such a high profile piece of legislation would have caused the end of Theresa May and a massive succession problem for the Tory party, so she decided to put the narrow party political interests of the Conservative party above the welfare of the nation. In many ways grandstanders like Anna Soubry are the worst. They're actually worse than the Tory Brextremists because at least the Brextremists are driven to inflict such harm on the nation because of their hard-right ideology. Soubry has no such excuse. She knows how bad it is. She keeps saying how bad it is. She wins plaudits for saying how bad it is. She garners sympathy when Theresa May's Blue-kip hate mob send her death threats for saying how bad it is. But when it comes to the crunch and she has the opportunity to actually stop it, she actually votes in favour of it! The hard-right Trojan Horse political party UKIP is collapsing into farce and bankruptcy, but the big hitters have already jumped ship. Nigel Farage quit as UKIP leader immediately after the 2016 EU referendum result came in, and the Brexiteer and major Leave.EU donor Arron Banks bailed out soon afterwards too. 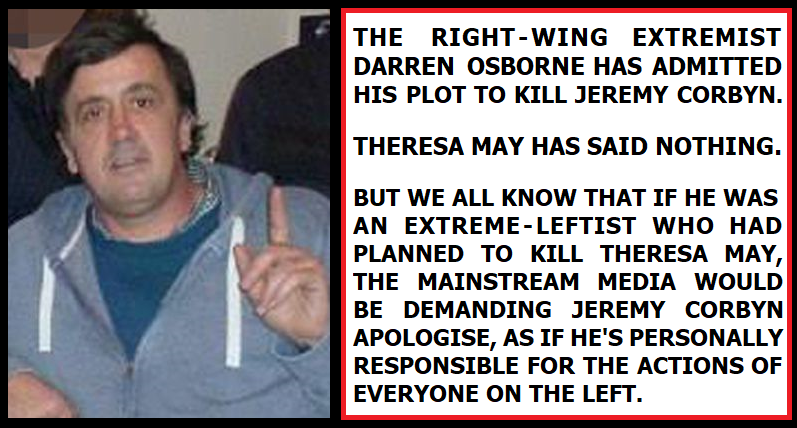 in order to concentrate on building the profile of his fanatically right-wing Westmonster propaganda operation. We've all seen how Theresa May has redirected the Tory party towards hard-right ultra-nationalism in order to attract all of these fickle Ukippers fleeing the wreckage of their party. We've seen how former UKIP councillors have been welcomed into the Tory party with open arms, and even utilised as pro-Tory plants in the BBC Question Time audience. And we've all seen how the majority of Tories have simply put up with this rapid shift towards the extreme-right political fringe because their power at any price ideology still sees this Blue-kip bastardisation of their own party as preferable to a centre-left government that would work to reverse inequality, protect the vulnerable, and dismantle barriers to social mobility. They'd genuinely rather see their own party turned into a demeaning UKIP tribute act than live in a slightly fairer society. The extent to which the Tory party is being colonised by radical hard-right blue-kippers was obvious enough even before the 2017 General Election, but now Arron Banks has come out and actually explained his plot to seize control of the Tory party. While the Labour Party membership has soared to over half a million since Jeremy Corbyn became leader, the Tory party membership has slumped so pathetically that they've been refusing to even admit how embarrassingly low it actually is for four years. Estimates put their membership at somewhere between 50,000 - 70,000, which is somewhere between 8% - 12% the size of Labour's. Arron Banks' idea is for UKIP to fold and for their politicians and party members to infiltrate the Tory party en masse in order to push for the hardest and most economically ruinous "no deal" Brexit. "We could have a clear majority in the Tory party for a real Brexit within months if UKIP wound up and all its members and FORMER members, all of its latent support in the country now joined up to the Conservative Party … Maybe by flooding back into the Conservative party we can change the course of history again. With a leadership challenge on the cards once more, this may be the perfect time." So here we have a former UKIP donor explicitly outlining his plot to infiltrate and usurp the Tory party for his own purposes, yet the Tories are doing nothing at all to stop it. In fact it seems likely they'd welcome the half million or so remaining Ukipper die-hards with open arms, because they're looking down the barrel of an absolute trouncing at the next General Election without them. If centre-right Tories had any decency and dignity at all they'd be demanding new rules to prevent ex-Ukippers flooding in to their party and taking it over from within (perhaps a ban on membership or leadership election votes for anyone who has been a UKIP member in the last five years). But the disgraceful reality is that most of them actually seem to see the rapid Ukipification of their party as the only hope to retain their weakening grip on political power. They realise that they wouldn't have even had sufficient MPs to bribe the DUP bigots into propping up their government if it hadn't been for the support of the fanatically right-wing and demonstrably fickle Blue-kip demographic, so they're now absolutely terrified of making any move whatever that might drive them away again. One of the most extraordinary things of all is that Tories can look at the undeniable and ongoing Ukipification of their party, and even read about Arron Banks' plot to usurp the Tory party completely, yet believe the reality-reversing mainstream media trope that Labour are the party that has been taken over by a radical fringe element! They actually choose to believe that Labour's popular centre-left policy platform that has attracted hundreds of thousands of new members to the party is the terrifying and sinister plot, whilst minimising/ignoring their own party's grotesque metamorphosis into a UKIP tribute act headed by a cowardly and directionless leader who is terrified of doing anything that might anger the fickle blue-kip demographic she's courted so egregiously, the secretive cabal of hard-Brexit Tory MPs who could oust her at any moment, the DUP bigots who prop up her government, or the Daily Mail hate mob who unleash torrents of abuse and death threats at anyone who dares defy Paul Dacre's fanatically right-wing and profoundly anti-democratic interpretation of the Brexit vote. There are still a few centre-right "one nation" type Tories left, like Ken Clarke, Sarah Wollaston, Dominic Grieve, Anna Soubry, Nicky Morgan and the like. Let's be absolutely clear that none of these people are heroes because they've actively promoted grotesque and destructive Tory policies like austerity dogma, wage repression, catastrophic infrastructure funding cuts, privatisation mania, and the systematic abuse of sick and disabled people. However it's important to distinguish between these old school Tory-Tories and the much more rabidly right-wing Blue-kippers. The problem is that these old school Tories know from experience that whenever they defy the ongoing Ukipification of their party then they get bombarded with hate mail and death threats from the Blue-kip hate mob. 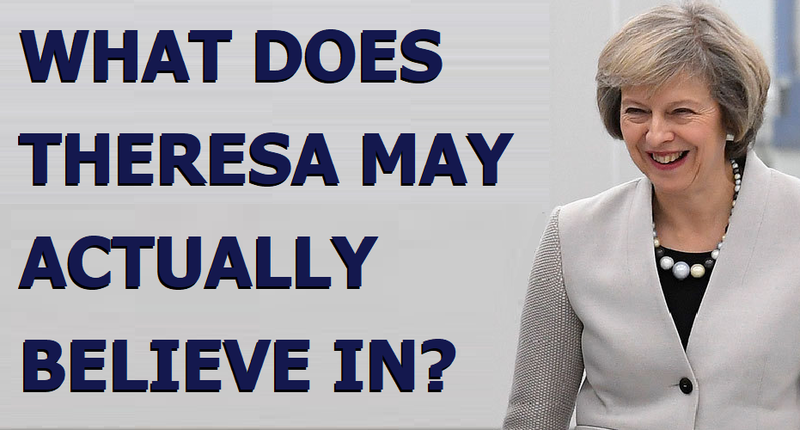 Will the old school Tory-Tories have the courage and the strength to fight back against the ongoing extreme-right drift of the Tory party? Or will they simply acquiesce to the Ukipification process because they either believe in maintaining political power at any cost, or they're too afraid of the growing power of the Blue-kip mob to dare stepping out of line again? 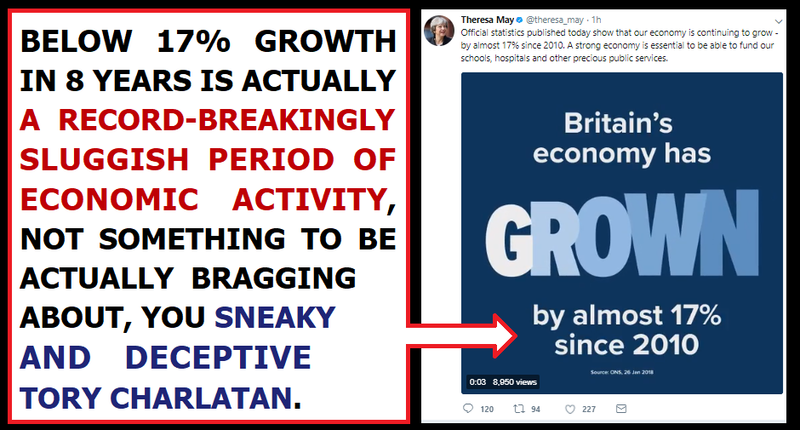 Theresa May is actually bragging about the Tories' lamentable economic record! 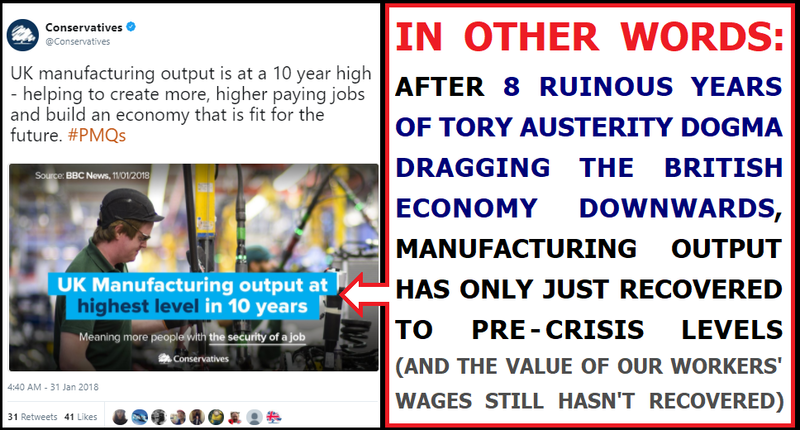 The Tory party propaganda machine is pumping out another new misrepresentation of their woeful economic record. This time they're actually trying to brag that the UK economy has grown by "almost 17% since 2010" as if that's some kind of remarkable achievement, rather than an extraordinarily sluggish growth rate. Here are four things you need to know about this highly deceptive new propaganda line from the Tories. 1. Under 17% growth in almost eight years is nothing to boast about at all. In fact, thanks to the global financial sector meltdown and the catastrophic effects of almost a decade of ruinous Tory austerity dogma, the UK has actually suffered an entire decade in which GDP growth has not exceeded 3.5% annual growth once, which represents the longest period of sluggish growth since reliable GDP growth records began in the 1950s. The Tories are actually trying to present this record-breaking period of slow economic growth as some kind of brilliant success story! 2. The period of slow economic growth since the Tories came to power in 2010 actually equates to the slowest post-crisis recovery the UK has suffered since the time of the Napoleonic wars! Economies usually bounce back after recessions like the 2007-08 bankers' crisis, but the application of ruinous Tory austerity dogma has caused the slowest post-crisis recovery in modern history, yet they're actually presenting this appalling failure as some kind of marvellous victory! 3. The latest GDP figures show a 0.5% growth rate for the final quarter of 2017, which is the 8th consecutive quarter in which the annual growth rate amounts to below 2%. This is the longest such run of sub-2% growth since the bankers trashed the global economy back in 2007-08. Eight consecutive quarters of below 2% annualised growth is woeful stuff in the absence of a major economic crisis like the global financial sector meltdown of 2007-08, yet Theresa May and her chums want to trick you into thinking it's a success story! 4. The UK is suffering one of the lowest growth rates of the major world economies. At just 1.5% annualised growth, we're lagging behind Italy (1.7%), France (2.3%), The USA (2.5%), the Euro area average (2.6%), Germany and Australia (2.8%), the Netherlands and Canada (3.0%) and Spain (3.1%). Bragging on about our economic growth rate when the UK economy is suffering one of the worst growth rates in the entire developed world, and growing at just 57% of the Eurozone average is a particularly Orwellian piece of reality-reversing Tory propaganda. 5. The economy may be experiencing very weak growth, but wages certainly haven't been keeping track. In fact the real terms value of average UK wages is lower today than it was 10 years ago. British workers have suffered the worst collapse in the value of their wages since records began, and Britain is the only country in the developed world where the economy has been growing but workers' wages have been collapsing. Bragging that the economy has actually been growing a bit when they know that their obsession with hard-right austerity dogma has trashed the value of workers' wages in the same period is basically asking UK workers to celebrate the fact that the Tories are giving them incrementally smaller slices of the national wealth, even though the pie has actually been growing! Other political parties that had overseen such an anaemic period of growth would probably try to change the focus of the political debate away from the economy and onto other things (the health service, security, education ...) but the Tories have such contempt for ordinary people like you and I that they actually believe that they can convince us that the record-breakingly slow growth and the unprecedented collapse in the real value of workers' wages that they have overseen are actually wonderful achievements to be celebrated and applauded! Of course millions of tabloid-addled dupes will lap it up because they're unwilling/unable to critically appraise the figures that the Tories are trumpeting as wonderful successes, but hopefully they're outnumbered by those of us who can see through this kind of deceitful reality-reversing Tory propaganda. Want to know why Brexit is turning into such a shambles? A National Audit Office report has found that Liam Fox's Department for International Trade is so unfit to secure post-Brexit trade deals that even after 19 months they haven't even defined "the range of capabilities and level of capacity it will require to undertake its role in delivering an independent UK trade function". Additionally they were only able to name a single person when asked to provide a list of the experienced trade negotiators they've been able to hire since the Brexit vote. Things are even worse at David Davis' Department for Exiting the EU which is the is the most chaotic and chronically understaffed department of the most shambolic government the UK has suffered in decades. 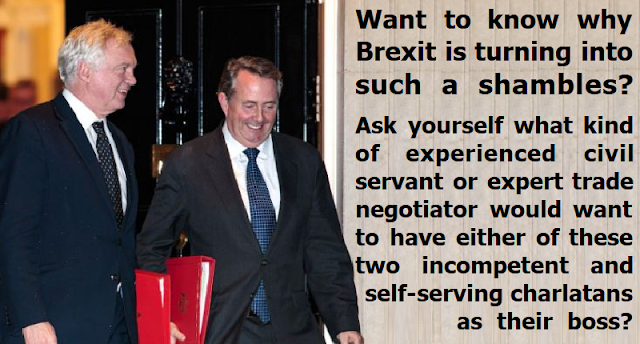 The reason these departments are such a mess is obvious: What experienced civil servant or trade negotiator would want to have either of these two incompetent self-serving blaggers as their boss? Working in either of these departments means continually defending whatever pathetic nonsense/lies/boasts/excuses that Fox or Davis are spewing at the time, then having your entire career tainted by association with the resulting mess once they inevitably screw it all up (and likely blame their subordinates rather than taking any responsibility whatever for their own shortcomings). It's obvious that nobody with any strategic sense whatever would chose to drink from either of these poisoned chalices, which means that both departments are largely staffed by people who have been drafted in from other government departments against their better judgements, and by those lacking the strategic thinking skills to steer clear of career suicide. A Brexit administered by a combination of the unwilling and the strategically naive, and headed by two of the most obvious charlatans in the Tory party! Even with highly competent ministers in charge of fully-staffed teams of experienced civil servants and expert negotiators, Brexit would still represent a hugely risky endeavour for the United Kingdom, but with incompetent self-serving charlatans like Fox and Davis running the show, only the most gullible and naively over-optimistic of people could ever imagine that their shambolic "make it up as we go along" approach is going to turn out just swimmingly.